Nail Clippers to trim your nails in a desired shape. Dual Sided Sapphire File to shape up the edges, file and smooth the trimmed nails. Nail Shaper to further define the nails. Dual cuticle trimmer/pusher to push back cuticles and keep them neat. A mini pouch for all the contents. Additional Information: Mini manicure and pampering session for your nails, anywhere, anytime. 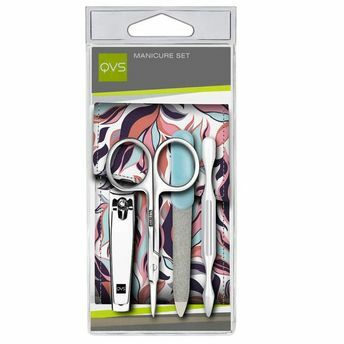 This QVS Neat Treat - Mini Manicure Set ensures that your hands get back the love for all th hard work they do for you. Explore the entire range of Manicure & Pedicure Kits available on Nykaa. Shop more QVS products here.You can browse through the complete world of QVS Manicure & Pedicure Kits .